We're Open, originally uploaded by sugarfreak. So it won't be this dark anymore. Irene was all about taking out our power here in Baltimore. We are without power and so is everyone else on our grid, which is mostly Falls Road shops, but also the Golden West Cafe. We'll be here for a while longer in case the power comes back this morning. ETA: Still no power! Hopefully it'll be back soon. ETA: Still no power this Monday morning. We'll be open anyway at 11am so you can browse books in the natural light of a dark shed. We sometimes get odd and interesting letters sent to us at Atomic Books. It isn't always easy to determine the intent of the sender. But we thought it might be interesting to share these letters from time to time. 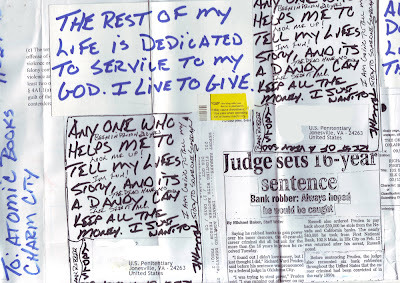 This letter was sent to us by an inmate in the US Penitentiary in Jonesville, VA. The other night, I was invited by a local organization of graphic designers to give a lecture on the history of the graphic novel. I finished that lecture with a list of reading recommendations. Since I rushed through it, and because a friend asked me for the list, I thought I'd post it here. So if you're looking for some quality graphic novel/comics reading, I suggest you try one of the many titles below. Arguably the first graphic novel. It's a 1930s autobiographical story told through 4 interwoven tales that is also a look at life in New York in the early part of the 20th century. Art Spiegelman tells the story of his father surviving the nazi death camps – using mice and cats. It won the Pulitzer Prize. All the world loves a list: Top 10s, Top 5s, Top 50s, it doesn't really matter how you number them. In fact, for magazines they are go-to sales boosters, and for web periodicals they are traffic drivers. But sometimes lists go wrong. Witness, for example, Kirstin Butler's "Comic Books as Journalism: 10 Masterpieces of Graphic Nonfiction" for The Atlantic. The first red flag comes when you try to figure out what qualifies Butler to rank such a list. Her bio states that she "is writing an adaptation of Gogol for the Google era called Dead SULs." While her project may be very good, there is nothing about it that suggests she is any way an expert in, or even particularly knowledgeable of, comics journalism. Then there is the list itself. This Friday, Tom Scocca, author of Beijing Welcomes You, will be at Atomic Books to help familiarize you with our new overlords. Starts at 7pm! Adult refreshments will be needed. This month's Reading Club pick is The Collected Stories of Amy Hempel by Amy Hempel. See you August 31st for the discussion - 7:30 at Atomic Books! New members are welcome at any time, and you get 15% off all the books for this year's Club titles. Join the Facebook Group for more discussion and updates.